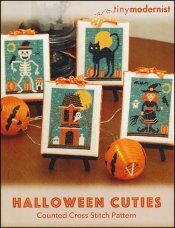 Halloween Cuties [E1262] - $12.00 : Yarn Tree, Your wholesale source for cross stitch supplies. Cross stitch pattern from Tiny Modernist. Four Halloween patterns: a witch, a skeleton, a haunted house, and a black cat. Finishing instructions on how to mount them on canvas stretchers, add ribbon and make the ribbon bows included . Stitch count each one 43w x 60h.